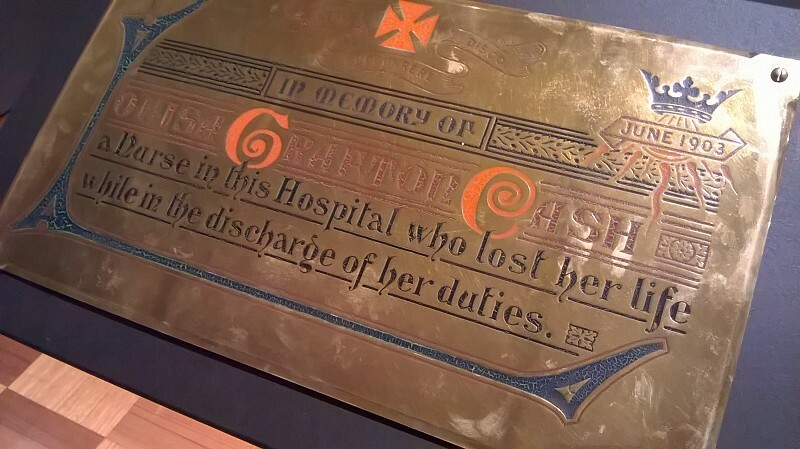 This plaque is currently in the Beds, Books and Bandages exhibition at the Queen Victoria Museum, usually hanging in the Launceston General Hospital. An outbreak of scarlet fever at the Launceston General Hospital, resulted in the death of Nurse Cash. This lady, who only joined the nursing staff a few months ago, was a Victorian, whose relatives reside in Melbourne. She was engaged in the fever ward of the hospital, and some weeks ago she was employed nursing a scarlet fever male patient, who died about a fortnight ago. Nurse Cash was only seriously ill about three days when the result proved fatal. Two other nurses are now suffering from the same complaint, and the hospital porter has also been attacked. One of the nurses is happily now convalescent. During the early part of yesterday a statement gained currency in the city that small-pox had made its appearance, and that some half a dozen people had contracted the disease. At first it was only, supposed that it was a wild rumour set afloat by some individual who desired to create a scare; but unfortunately the rumour in this instance proved to be only too true. Immediately upon the first intimation that an outbreak of the dreaded disease had occurred a representative of the “Examiner” was told off to ascertain the truth or otherwise of the statement, and after meeting with considerable difficulty during the preliminary stages of his investigation, owing to the reticence displayed in certain quarters to give any information upon the subject, the fact was fully established that not only had small-pox broken out in the city, but that the disease had a made its appearance some three weeks ago, and that since then 11 cases had occurred, two of which have terminated fatally. That such a condition of affairs should exist in a city of the size of Launceston without the health authorities being apprised of the fact seemed incomprehensible, as the act makes it imperative that wherever there is the slightest suspicion regarding the contagious nature of a disease the case shall be at once reported to the local board of health. In the present outbreak, however, not the slightest hint was given that the patients–some of whom have recovered from the attack–were suffering from a disease, the eruptive nature of which could not be fully determined; notwithstanding that in one instance which terminated fatally the patient after the third day developed a red pimply eruption which changed to vesicles and pustules. The alarming fact remains, however, that small-pox has been preva lent in our midst for some three weeks, and that up till yesterday evening no official report was furnished to the health authorities that the disease had made. The announcement, as may be supposed, that an outbreak had occurred occasioned considerable surprise to the local board of health, more especially when the report stated that three persons residing in the very heart of the city had developed the disease, the patients being–Mrs. Tilley, residing with her husband at 35 Margaret-street; H. Cox, an employee in the Telegraph Office, also living in Margaret-street; and Albert Thompson, a child, residing with its parents at 256 Brisbane-street. Upon further enquiry being made last night, however, the alarming information was obtained that a man named Duggan died in the General Hospital on June 7 from small-pox, and that Miss Louisa Cash, a nurse at the institution, who had been in attendance upon Duggan, also died on Saturday from the same disease; her funeral, which took place yesterday after noon, being attended by the chair man and members of the hospital committee. But unfortunately these are not the only cases that have occurred at the hospital, as there are now no less than four members of the staff who have developed symptoms of small-pox, two undoubtedly so, while the others are in that stage in which it is somewhat difficult to diagnose tile disease with certainty, although there is very little doubt that they have contracted it. The medical superintendent (Dr. Heyward) informed our representative last night that all the patients had been isolated, and that every precaution would be taken to prevent the disease spreading. All the wards are to be fumigated, and it is more than proable that the hospital will be closed for a few days. A letter was read, which was sent to the parents of the late Nurse Cash, expressing the Board’s keen regret at the loss, by death from small-pox, of a valued friend, who had given her life in the cause of helping her fellows. MEMORIAL TO NURSE CASH. UNVEILED BY THE PREMIER. 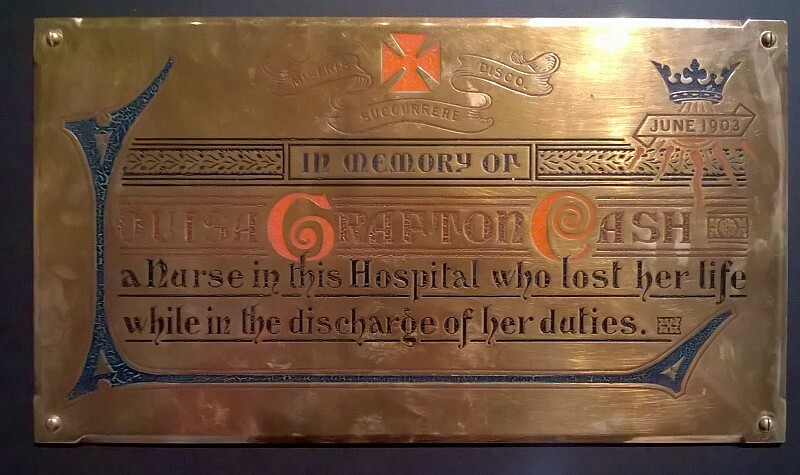 In the entrance hall of the General Hospital is placed a brass tablet bearing the following inscription: “In memory of Louisa Grafton Cash, a nurse in this hospital, who lost her life while in the discharge of her duties.” Above this inscription is the date June, 1903, and the motto of the hospital: “Miseris suocurrere disco”— “I learn to relieve the distressed.” The tablet is to record the fact that Nurse Cash died while discharging her duty during the smallpox epidemic in Launceston. A. patient was admitted to the Isolation Hospital, and a week after he died, Nurse Cash and Nurse Robson were seized with the malady. In three days the latter was almost well again, but Nurse Cash was dead. Yesterday afternoon the tablet was unveiled by the Premier (Mr Evans) in the presence of a large gathering. Mr H. Weedon, in calling upon Sir Evans to perform the ceremony, said that the memorial to Nurse Cash took the form of the tablet in the entrance hall, and a monument in the cemetery, which would at some future time be completed and unveiled. A proportion of the fund had been left over from the amount collected, for a presentation to the doctors and nurses, who kindly handed the surplus (about £10) to the fund. The Mayoress (Mrs Pepper) also collected an amount, and thus they were enabled to hare the tablet and the memorial in the cemetery. Mr North made the design, and the tablet was executed by Messrs. Brooks, Robinson, and Co., of Melbourne. The Premier, in unveiling the tablet, which was covered by two crossed Union Jacks, said that it was hardly a pleasant duty he had to perform, because one could not express pleasure in such a matter. Still, it was gratifying to all those who had sub scribed to know that they had placed a tab let to record that Nurse Cash died while performing her duties. There were ladies working in the ranks of the nurses, not for a financial purpose, but for the love of the work. In South Africa numbers of them, including some from Tasmania, hid given up their lives to their duty. There was good work being done at home as well as that which had been accomplished on the battlefield. There was a body of nurses in the Launceston General Hospital who were a credit to the institution and all connected with it and they now had before them a memorial to one who had worked among them so faithfully and so well. The tablet was then unveiled. The monument over the grave of the late Nurse Cash, who died of small-pox during tho outbreak in Launceston in 1903, has now been completed, and erected in the general cemetery. The base is a solid block of dressed Malmsbury (Victoria) bluestone, upon which is a “recumbent” marble cross, about 6ft. in length. On a panel of the base is the following inscription: -“Erected by the citizens of Launceston to the memory of Louisa Grafton Cash, a nurse in the General Hospital, who lost her life in the discharge of her duty, 16th June, 1903.” An iron rope railing encloses the grave.